MANILA, Philippines – If there’s one thing that separates Senator Ferdinand “Bongbong” Marcos Jr from the other vice presidential candidates, it would be being the son and namesake of former President Ferdinand Marcos. In a tight race with Senators Francis Escudero and Alan Peter Cayetano – both scions of political families as well – and newbie politician Leni Robredo, being the junior of one of the country’s most prominent presidents is a strong edge. Despite the atrocities and human rights violations committed during Martial law, the Philippines’ longest serving president has established a strong support base across the country through programs and infrastructure projects he was able to initiate for 21 years. In fact, Marcos Jr’s supporters – even those outside their bailiwick of Ilocos Norte – cite his relation to the late strongman as to why they will vote for him. It is notable how the vice presidential aspirant incorporate his parents’ accomplishments into his campaign. 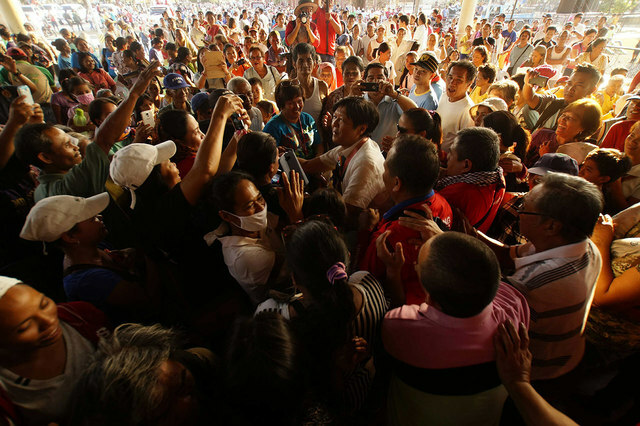 Marcos kicked off his campaign in the city of Batac where the family’s political prominence was born. This was the birthplace of clan patriarch Mariano Marcos, father of President Marcos who also grew up here. Three generation of Marcoses, including Imee Marcos, served as the district’s representative in Congress. Ilocanos have a strong loyalty to the family because, as they recall, it was during President Marcos’ time when their province was at its most progressive and when it was brought to the national spotlight. 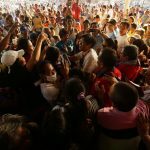 Barangay Bagong Silang in Caloocan and Barangay Longos in Malabon are resettlement sites opened by President Ferdinand Marcos, which provided housing for thousands of landless Filipinos living in slum areas such as in Tondo, Manila. It was a project initiated by his wife and former First Lady Imelda when she served as the Minister of Human Settlements. Muntinlupa was first part of Rizal and then of Laguna. President Marcos issued Presidential Decree No. 824 on November 7, 1975, which included Muntinlupa as part of Metropolitan Manila. It also served as one of the sites for the Urban Bagong Lipunan Improvements of Sites and Services (BLISS). Launched in 1979, BLISS was a housing program that built 3 to 4-storey apartment buildings, with units given to low and middle income families in a rent-to-own payment basis. The National Institute of Molecular Biology and Biotechnology, also known as BIOTECH, is a research institution mandated to develop more efficient technologies for agriculture, forestry, environment, and energy. It was created on December 10, 1979, and initially funded by the Ferdinand E. Marcos Foundation. In 1974, the late president honored the T’boli by granting them their own municipality named after their tribe. The municipality of T’boli was established through Presidential Decree Number 407 issued on March 5, 1974. When Marcos Jr visited the town on March 9 – 47 years since the town was established – he was declared as the tribe’s “supreme leader” and became an adopted son of the T’boli and Blaan tribes. It won’t be a stretch to say that the reception he received from the people in these campaign stops could foreshadow the support he would get in terms of votes. As sociologist Clifford Sorita explained, it is like paying a “debt of gratitude” to the Marcoses. Sorita said that people in these places not only appreciate the physical projects, but also appreciate the mere fact that a prominent public figure visited them. For them, projects and programs reflect the importance an official places on them as a community. Candidate Marcos reaps the benefits of their supporters’ gratitude because he is the living representation of his father. “Filipinos are very external, very tactile. They have to be concrete about [their expression]. Since the father has passed, [gratitude] has to be given to the next of kin,” Sorita told Rappler in a phone interview. Although Marcos does not deliberately ask for these people’s support, Sorita noted that him re-visiting these project sites sends a message to the beneficiaries that he is as close to them as his father was.